Every citizen of the United States of America has been affected in one way or another because of the poor economy of the past two years. Whether someone lost their job and their home and all of their money, or simply saw prices rise on goods like oil or saw a decline in shops to buy new goods at on the weekends, every single American was hit by the current economic crisis. And the President of the United States himself, Barack Obama, has been adversely affected as well. While many Americans work hard all day, everyday in order to save up for their retirement and their children’s college, in addition to putting food on the table and paying the bills on a daily basis, the hard times make doing those common things much more complicated. And President Obama has felt it himself. Obama, like many Americans is trying to instill the value of a dollar to his daughters. 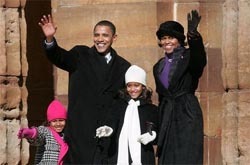 The President and the First Lady have opened up savings accounts for each of their daughters, as well as providing each with an allowance that Malia and Sasha each use frugally. Obama told reporters that he tries to explain to them the concepts of money savings tactics and how interest works for and against them. While it is true that not every citizen of the United States of America will get out of their economic turmoil in the same fashion as Barack Obama and his family, there is still much hope for the men and women of America. With Obama pressing for more benefits and tax cuts for the middle class, the men and women of the United States can be assured that President Obama is working for them and here to help their economic situations. I like how he’s trying to relate to us while hiding the millions of dollars he’s made from the book he wrote a few years ago. lol. What’s the book called? I’d be interested in reading.